Under the law, there are a variety of different DUI offenses with which a driver could potentially be charged. The courts have made it clear that driving under the influence of any drug (23152(f) VC) and driving under a combined influence of any alcoholic beverage and drug (23152(g) VC) are both illegal. 2. When the defendant drove, he or she was under the influence of alcohol, a drug (prescription or illicit) and/or both. A drug is defined as a substance that when introduced into your body causes changes to its physiological state and causes impairment. It is not a defense that the defendant was legally entitled to use the drug. To determine if the driver is under the influence, the deputy will make several observations looking for general indicators of being under the influence of drugs or alcohol. The deputy will then demonstrate and ask the driver to perform a series of Standardized Field Sobriety Tests. The tests employ the concept of divided attention to assess the driver’s impairment. The deputy will also conduct a series of tests on the eyes (horizontal and vertical nystagmus, lack of convergence). These tests are physiological in nature and are indicators of alcohol or drug use. The deputy may then use a preliminary alcohol screening device to take a preliminary breath test to either confirm or rule out alcohol. The Sheriff’s Department has been preparing for the potential legalization of marijuana for the last ten years when medicinal marijuana was legalized. During those ten years, DUI marijuana cases have been steadily on the rise. 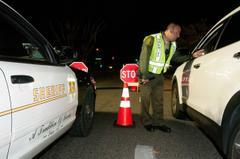 Equipped with the expertise gained through specialized training in Standardized Field Sobriety Tests, Advance Roadside Impaired Driving Enforcement and Drug Recognition Expert training, the Los Angeles County Sheriff’s Department is prepared to identify impaired drivers whether it is alcohol, drug or a combination of both, and arrest them. The Los Angeles County District Attorney’s office has received much of the same training and is prepared to prosecute the potential increase in related arrests.